Tree Girl by T. A. Barron. Review: Where did you find me? Rowanna asks her guardian, Mellwyn. Although at one time he was a stranger, Rowanna gets to know him. Were her parents tree ghosts? Where were they? Those three questions Rowanna is dying for him to answer. 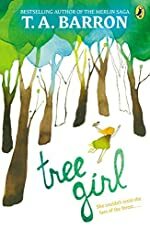 Tree Girl is a riveting story about how a girl struggles with trying to understand her life with the forest. She has always told never to go into the willow. She has been told to never speak of it. She has also been told never to ask about herself and the willow. So, what is in the willow? Rowanna was found as a baby in the high willow down inside the great forest that stretches in front of her house. Her house is small, very small. It has one room, a kitchen, and one bed that fits into it. She is pretty much alone on this island, except for her guardian, a fisherman with a ruffed up beard. He is the man that found Rowanna and took her in. With a giant forest to one side and a giant ocean to the other, not many people would want to live there. But, Rowanna does, she is crafty and smart and knows how to make things out of twigs. She also knows how to plant and make her plants thrive. She is motherly and brings in a sick, wounded bird nursing it to health. But Rowanna is also very curious, especially about herself and her family É her real family. She wants to know where she came from, were her parents there, did the man see her parents, did her parents love her, who were they, and who see was. Rowanna has asked where what the willow was like several times, but the man won't tell. She doesn't know why. Why is so bad to say? She doesn't know if there are tree ghosts there or not because she has never been there. Rowanna needs answers and she isn't getting them. Tree Girl is a suspenseful, interesting, and compelling book. Many people can to relate to Rowanna's problem and life. The book has a great setting putting the story in the perfect location to imagine Rowanna's life and problems. The story has a great exposition that really setts the story up for the dangers and journeys Rowanna will have in the future. I love the characters and their characteristics; it gives the story a feel and interest; like Mellwyn is a rough sailorman, and Rowanna is a likeable well-behaved girl. The jargon in the story also gives interest like, "Claw ye to bleddin' shreds, they will. Or crush ye, bones and all, with their graspin' feet." I recommend Tree Girl to people who love fantasy and adventure. This book will appeal to readers in middle and high school. Even though the jargon is a little hard to understand sometimes if read over a few times the younger ages will understand. I hope other young readers will come to know this book and get a sense of how lucky kids are to have a family that loves them. You will only find out what happens to Rowanna in the High Willow if you sit down and enjoy this phenomenal book. You won't be able to put it down until you finish it! We would like to thank T. A. Barron for providing a copy of Tree Girl for this review. Have you read Tree Girl? How would you rate it?